Elica’s Nikola Tesla cooktop features a fully integrated extraction fan. 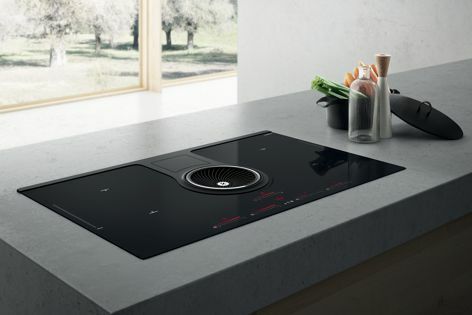 Nikola Tesla by Elica combines an induction cooktop with a fully integrated air-suction system. A central fan with a suction speed of up to 900 cubic metres per hour captures fumes and odours quickly. Featuring nine cooking power levels, the extraction fan has a maximum noise level of 59 dBA.